At 6:31 in the evening on May 26 eleven members were sent to an outside fire in Gull Lake Village.The fire had started innocently in the backyard fire pit but a spark ignited nearby poplar fluff andtravelled through trees and undergrowth to the yard next door. Firefighters doused the area andthe neighbouring home sustained minor damage to the exterior siding. Late in the evening on May 29crews were sent to a residence in town where an infant was reportedlyhaving difficulty breathing. The baby was cared for until EMS arrived and released the BFD from scene. On May 30 at 8:47 p.m. members responded to an alarms call in Bentley. This turned out to be acooking incident and was deemed a non-emergency so the fire crews returned to the hall. On June 7 eight members were sent to another alarms call in Bentley. This one involved burning toastwhich triggered the home's smoke detector. No injuries, no damage and fortunately, no emergency. At 5:45 on the evening of June 9 a call was received of a watercraft in distress on Gull Lake, just eastof the end of the ice fishing road near Brownlow's Landing. Five people in two small fishing boats hadtried to make it to shore in the windy weather. Unfortunately, the batteries in both vessels died, leaving them to drift into shore where firefighters found them and towed one boat the remaining twenty feet in.Crews and a helpful pair of nearby residents got them back to the campground so they could retrievetheir tow vehicle. Thank you to those who assisted! 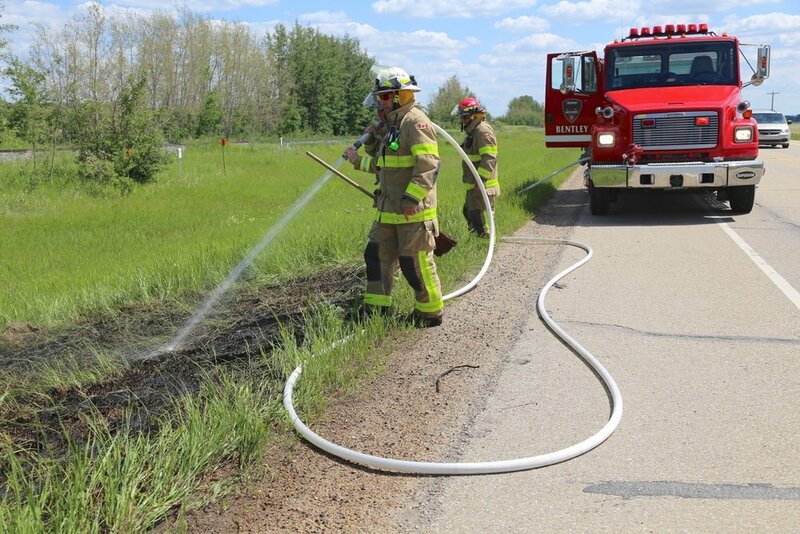 On June 18 at 2:32 p.m. a passerby called in a small grassfire in the ditch on Highway #20, just South of Twp. Rd. 41-2. Bystanders had most of the fire out so firefighters thoroughly soaked the area toprevent any re-kindles. And at 6:14 a.m. on June 19 members responded to a call at a Bentley home where a resident withbreathing problems had fallen and was unable to get up. BFD members cared for the patient untilparamedics arrived and crews carefully helped load him for the trip to the hospital. On June 19 and 20 we enjoyed hosting the Bentley Elementary School's two Kindergarten classesfor the annual fire hall tours. The students were full of interesting questions and keen excitement.Boys and girls, we hope you have learned some helpful things you can share with your families!